Surface pattern designer Melissa Davin-Smith has been chosen as one of ten up and coming designers to showcase her first design collection at HOME London. Melissa’s designs feature bold hand-drawing and colourful geometric shapes. She cites her work in the flooring trade as a huge influence in her work. 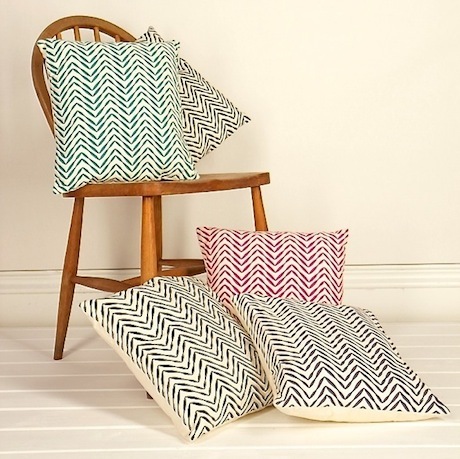 Being surrounded by patterns, colours and textures on a daily basis has helped her product a well rounded selection of designs that suit all manner of mediums, from notebooks to cushions. Melissa Davin-Smith works closely with a digital printing company in the UK, who she chose for their friendly approach and eco-friendly Organic Cotton base cloths. From her screen printed one colour designs when starting out, Melissa is excited about the future of her digital designs, showcasing two new multi-coloured designs at HOME London. The range is full of fun colours, modern florals and striking geometric shapes on cushions, lampshades, pouches, notebooks, and fabrics. The seven collections include Dot, Chevron, Fern, Starburst, Emerald, Dash and Button. All items are digitally printed onto Natural Organic Cotton Twill base cloth in the UK and items are hand sewn by Melissa in her studio in the UK. Melissa Davin-Smith will be exhibiting on the Heart Home stand at Home London from 12 – 14 January. Earls Court 2, London.